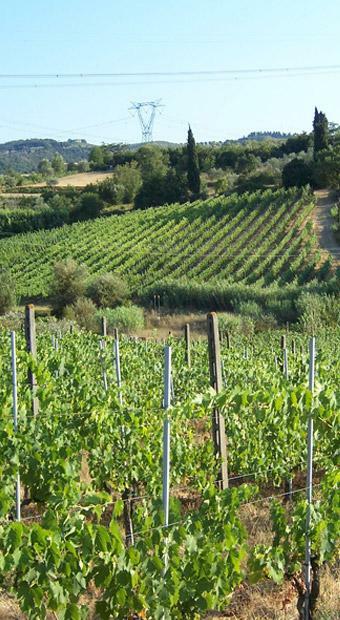 Fattoria Ambra has belonged to the Romei Rigoli family since 1870. The estate is located near the Ombrone river and the Villa Medicea of Poggio a Caiano. It is named after the poem "Ambra", written in the 15th century by Lorenzo Il Magnifico. The vineyards, of an extension of 20 hectares, stand in the hills of Montalbiolo, Elzana, Santa Cristina in Pilli and Montefortini, four of the most important crus of Carmignano. DOCG Carmignano is bottled as "Riserva Montalbiolo", "Riserva Elzana", "Montefortini - Podere Lombarda" and "Santa Cristina in Pilli". The blend is mostly Sangiovese together with Cabernet Sauvignon, Canaiolo Nero, Colorino, Merlot and Syrah. A young version of Carmignano, "Barco Reale", and a rosè wine, "Vin Ruspo", complete the range of wines. Robert Parker 90"This wine is alive with the fruitiness of cherries and currants with hints of tobacco and cedar. Its earthy tannins and acidity go perfectly with robust pasta dishes or with grilled red meats."